TCU senior shortstop and former LBHS player Keaton Jones. With two on and two out in the top of the sixth inning of a 1-1 game, former Laguna Beach High School shortstop Keaton Jones (’11) stared down an 0-2 count and belted a two-run double to left center to lead Texas Christian University over defending College World Series champions Vanderbilt on Sunday, March 8, at Dodger Stadium. 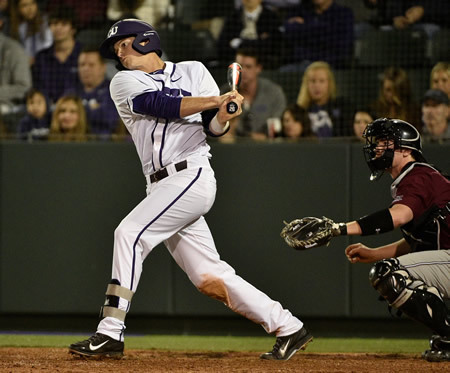 Jones also laid down a sacrifice bunt in the ninth to help the Horned Frogs pick up an insurance run in the 4-2 win. Jones, who played shortstop and pitched for the Breakers, was named Orange Coast League pitcher of the year and second-team all-CIF in 2011 after finishing his senior season 7-0 with six saves in 13 appearances. That performance earned him an invite to TCU. But when TCU’s shortstop recruits faltered in training camp that year, Coach Jim Schlossnagle decided to give the freshman Jones a shot at one of the games most demanding positions. With the Vanderbilt victory, the senior has started all but one of his team’s 195 games since he arrived as a walk on at the Fort Worth campus. Since the beginning, Jones’ defensive skills have never been in question. In the season opening win over Southern Illinois this year, he became TCU’s all-time career leader in assists with 555. The next day he recorded his best all-around game as a collegiate player, when he rocked Southern Illinois pitching for two doubles and his first career homer. He also drove in two and scored two while recording two put outs and four assists in the field. He is currently hitting .289, 63 points above his career average and 23 points above last season. The Vanderbilt game was the third in a four-game west coast swing for TCU. They lost the opener to USC 7-6 in a 12-inning contest that saw Jones collect a career high four hits, going 4-5 with an RBI and run scored. TCU beat UCLA the next night 3-1 to run their season record to 10-2, ranking them ahead of Vanderbilt in every poll going into their finale against Loyola Marymount on Tuesday, March 10.